SNES Eek! The Cat (USA) in 17:45.05 by WarHippy. Eek! 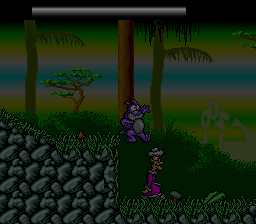 The Cat is a game based on the old cartoon series of the same name. Your goal is to kick and shove an NPC to the exit of each level while avoiding enemies and obstacles, and all to the tune of some sweet music. So sit back, relax, and let the fun begin! WarHippy improves the previous run by 58.42 seconds, thanks to new routes, new glitches, better optimisation and by selecting the easier difficulty setting.